It was Sunday night, November 6, 2011, my Papa said he would take me hunting Monday evening after school. He met me at my house. We sprayed our clothes with scent killer and put our hunting clothes on. We started to the tree stand and spooked a deer walking in. Finally, got to the stand and climbed in. We saw two doe run behind us and decided to stand up. We stood for about 20 minutes and sat back down. As soon as we sat back down a buck came in from behind the stand. I had to wait before it went behind a tree to stand up, and then wait again for it to go behind another tree, so I could draw on it. By now the deer was about 20 yards away and still coming closer. I waited to make my shot when he was about 16 yards away and standing broadside. I blatted to get him to stop and then I shot. He took off and we heard a lot of crashing in the woods. Then we heard him blat one more time and silence. My Papa and I high fived, we were so excited. As, we sat there a bit I realized that I never shook when the deer came in or when I was ready to shoot him, but after all the excitement my legs started to shake like crazy. We waited in the stand for about ten minutes and climbed down. We came home to wait for my dad and his friend, Joey, to get done hunting and then we could go tracking. I wasn’t sure how far it went or if it was even dead by know. We started at the spot where I shot it and no blood. We started looking around where I saw it stop, do a circle and run off again. My dad found the first blood, lots of it. I was surprised he found it because he has a hard time seeing blood or the color red. We all started speed walking following the blood and there he layed, about 50 yards from where I shot him. Holy cow, was he big, 8 points. 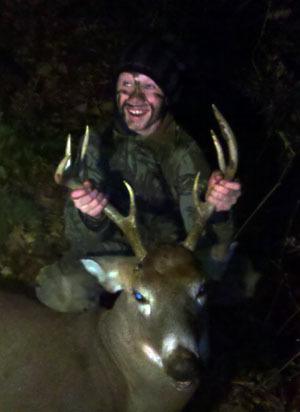 When I shot him I thought he was a six pointer. I was so excited!! !